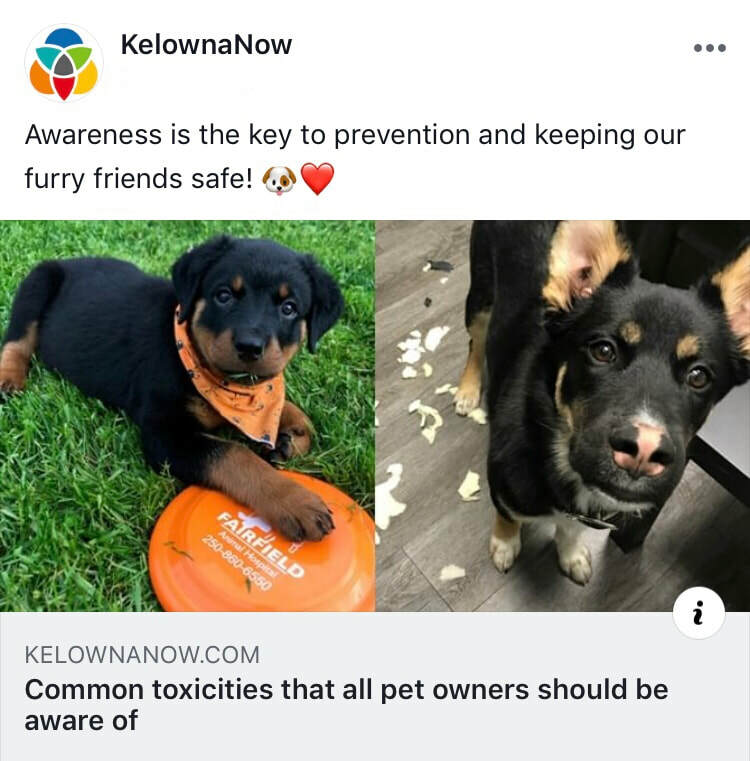 Pets First offers monthly tips and information for pet owners in the Okanagan so that we can all stay safe and have fun with our furry friends in this beautiful valley! 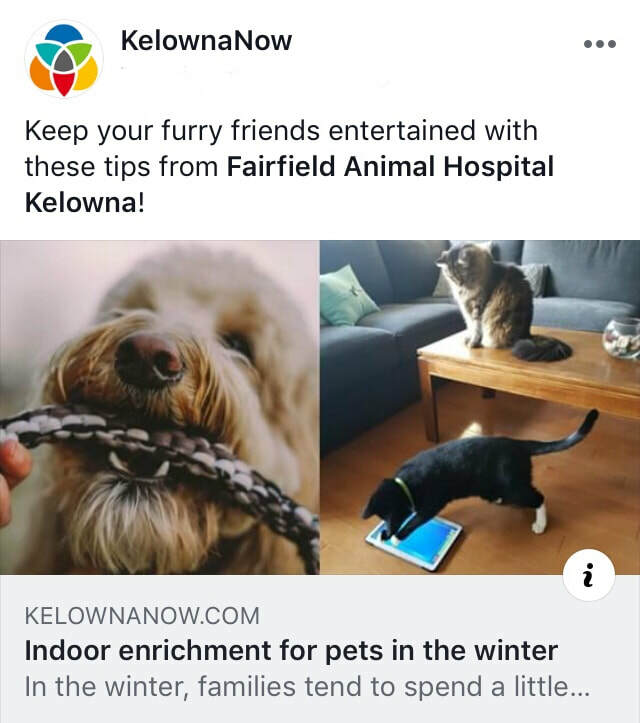 Pets First is written by Fairfield Animal Hospital, Central Valley Vet Hospital, and Westbank Animal Care Hospital, and is brought to you care of KelownaNow. However, many pet owners don’t realize how that list of potential risks is much more substantial with our furry friends, especially if they are prone to getting into things they shouldn’t! Something that seems fairly harmless to us can be extremely harmful for our pets. Pet insurance companies have recorded paying out over $2.9-million in one year towards toxicity cases in dogs and cats. Educating ourselves on these risks is the first step to avoiding a potentially life threatening situation, and an expensive vet bill! 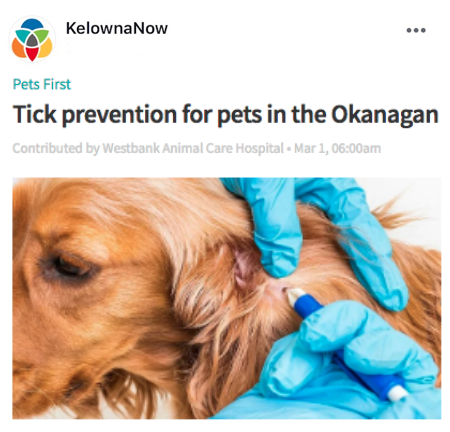 ​​March Article: Tick Season is here! Once all of this snow clears up in the valley, we will be heading straight into tick season. Here is some information to help keep you and your pet protected from these pesky parasites! Contrary to popular belief, ticks are not “insects.” They have eight legs, so they are actually arachnids, like spiders and mites. The holidays are a wonderful time of year for people and their pets to be together with family. Will you be giving your pet gifts for Christmas morning? Some great safe toys for dogs include rubber items like Kongs and stuffing-less plush toys, while cats may enjoy laser pointers or toys with feathers or catnip! With any pet toy, it’s important to monitor their play to be sure that stuffing, string, or ribbons are not ingested, which could cause an unexpected intestinal blockage. No one plans an emergency visit with their pets over the holidays, so here are some other common risks to avoid during the Christmas season. November is Senior Month at the vet clinic, where we like to celebrate and honour our wonderful senior patients. Generally, cats and dogs are considered a “senior” around seven to eight years of age. Larger breed dogs tend to have shorter lifespans compared to smaller breeds, so they are sometimes considered a senior by five to six years of age. Once our furry friends become seniors, yearly wellness checks are important to identify, monitor and treat any issues that may arise due to advancing age. Age-related diseases can arise subtly, and their symptoms may be easy to miss. Regular vet visits can help set a baseline for what is normal for your pet, which makes it easier for owners to notice when something has changed. Though most don’t realize it, obesity is the most common nutritional disorder in companion animals. An estimated 60% of cats and 56% of dogs are considered overweight or obese, and as we move into a time of year where we all lower our activity level, this is important to keep in mind for our furry friends. While many of us think it’s cute to see a chubby pet, the reality is that obesity can severely affect their health, as well as the longevity and quality of their life. Obesity can cause arthritis, high blood pressure, diabetes, kidney disease, and cardiac disease for our furry friends. So how can an owner figure out if their furry family member is carrying too much weight? Owners can look to a veterinary Body Condition Score chart, and follow some simple steps. 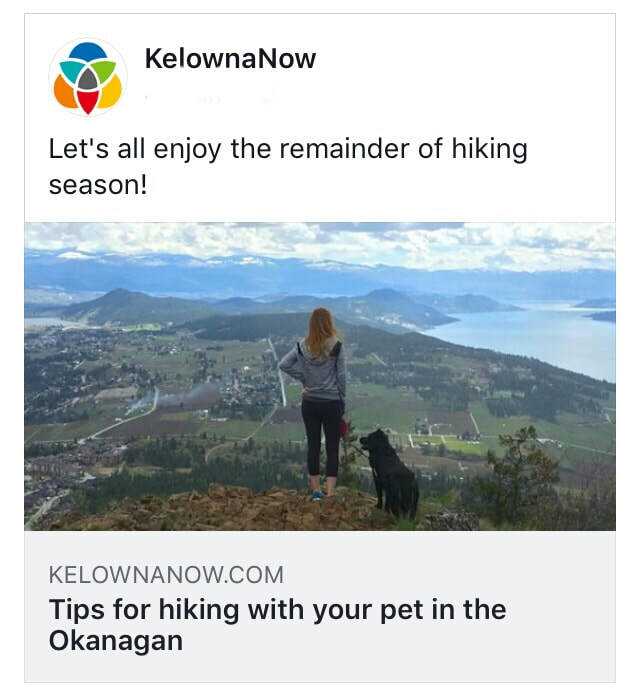 Now that the smoke is beginning to clear in the valley, pet owners will want to be getting outside and hiking with their furry friends again, and living in the Okanagan provides us with some of the best places to do so! Always do your research before heading out. Nothing is worse than arriving to a trail only to find out it's not dog-friendly! Familiarize yourself with who else might be using the trail. Many trails around the Okanagan are shared with mountain bikers, trail runners, and equestrians. While it’s not something we want to think about, emergency preparedness is important to keep in mind for residents in the Okanagan. 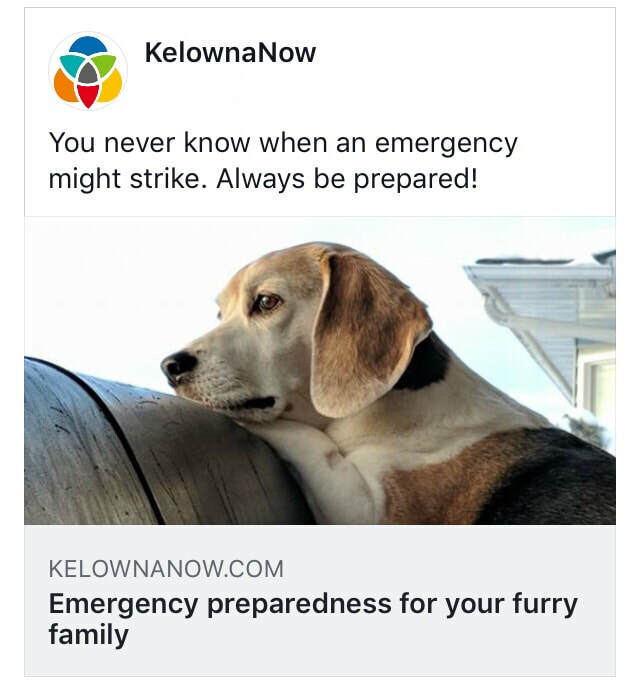 From flooding to forest fires, it’s imperative for families to have a plan in the event of a crisis or evacuation, not only for themselves but for their furry family as well. These stickers let emergency responders know there are animals in the house to be rescued. They indicate how many pets of each species are inside, and may give the name and address of your local veterinarian or rescue organization. Summer is here, and we’re here to help you and your furry family stay safe and have fun! Here are some hazards to watch for when you’re exploring the valley with your pets, and ways to avoid them. When temperatures are heating up outside, so are the sidewalks! Your dog’s paw pads are sensitive to the heat. There is a simple test to see if the asphalt is too hot. Place the back of your hand on the pavement - if you cannot hold it there for five seconds, it’s too hot for your dog’s paws.